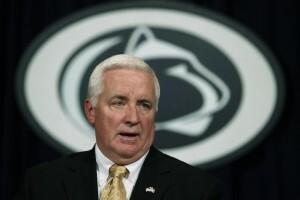 HARRISBURG, Pa. – The Corbett administration on Friday asked a state appellate court to halt the release of hundreds of pages of e-mails sent between former secretary of education Ron Tomalis, Penn State officials and top aides to the governor. The 644 pages of public records in the hands of the Department of Education were exchanged in the aftermath of the Sandusky crisis and during the months leading up the announcement of penalties against Penn State’s football team. They were sought in a Right-to-Know Law request that was filed in May. On the last day of its deadline to respond to the request, the education department demanded more than $300 in copying fees before it said it would decide if it would release the records. But the state’s Office of Open Records sided with previous Commonwealth Court rulings that said an agency can’t demand prepayment before it determines if it will release the records. Though state lawyers refused to decide if the records could be released, they changed course on appeal to the OOR and argued the records are exempt from disclosure. However, the OOR decided they didn’t meet their burden of proving exemptions applied. (It is challenging to prove that a record is exempt from disclosure without looking at the record you content is exempt). The suit marks the third time lawyers with the Department of Education have sued to overturn an order by the state Office of Open Records to release public records sought by the Penn State Sunshine Fund. The second, involving three e-mails between Tomalis and lawyers for the governor, was filed in July and is proceeding in Commonwealth court. The third, filed in early 2013, was settled. All filings in the case may be viewed here. The Penn State Sunshine Fund is a grassroots effort that was formed in October 2013 to help pay for legal expenses related to obtaining public records about university activities. More than 300 people from 221 cities in 33 states have contributed $42,000 dollars toward its $50,000 fundraising goal. Supporters may donate by visiting www.pennstatesunshinefund.org/donate/. The Board of Trustees executive committee started planning for the release of the Freeh Report more than two months before it was released.